Sub: Guide lines for transfer to regulate transfer of Group ‘C’ officials – Amendments – Reg. Some suggestions are submitted on the Guide lines for transfer to regulate transfers of Group ‘C’ officials issued vide Dte. No. as referred above for your kind and sympathetic consideration. Para 5-1 (i)Present post tenure of 4 years should not be reduced to three years, because it will create more disturbance for officials and consequently it will adversely affect the postal services also. (ii) The station tenure of 6 years should also not be made applicable on Group ‘C’ officials. In Cities, Departmental Post Offices are more in no and less in rural areas. Therefore more difficulty will arise in adjustment. Further some bigger cities are having more than one division. How there officials will be accommodated. Eg.- Delhi, Mumbai, Calcutta, Chennai, Hyderabad, Bangalore etc. It is therefore requested to kindly consider sympathetically on these two aspects and take decision favourably so that the Group ‘C’ officials may get relief and Postal Services should also not be affected adversely. Hoping for a positive action. Sub: Rotational Transfer of SBCO official as per New Guidelines. As per guide lines issued by the Department vide no. as referred above, the tenure of SBCO officials has also been declared as three years instead of 4(four) years which is in existence now . The station tenure is also declared as 6 years. In this connection we would like to bring some facts to your kind notice for sympathetic consideration. SBCO was formed bifurcating from the P&T audit purely on Administrative convenience and setup at each Head Post Office. The LDC and UDC working pattern had also been modified all along these years and both are merged and formed as PA(SBCO). Till then, SBCO is considered as a unique one and right from the recruitment it has separate identity. SBCO is working as such at par with other cadre like Postal Asst (CO), DAP, P&T audit etc., and doing audit work in the present setup. While the officials in Circle office, DAP and P&T audit have no transfer to other office unless they are willing or they are promoted, Postal Assistants are liable to be transferred within the same Postal Division whether it forms within a city or not. SBCO officials are liable to be transferred to other HOs once in 4 years and therefore separate guidelines are applicable to SBCO. The promotional avenues for the Postal Assistant cadre is also more. This shows no parity among the cadres. It is noteworthy here that the Pay and allowances are same to Postal Assistant (SBCO) like Postal Assistant (PO) Postal Assistant (CO). But SBCO officials are transferred to other HOs in the Division cluster. This involves more expenditure maintaining two establishments living away from family and also not remain in a position to lookup the family being head of family. Sacrificing all these things, the SBCO officials are rendering their best services to the Department and a good custodian of Public money. As such it is strongly felt that treating SBCO cadre at par with other PA cadre is not acceptable. It is therefore requested to kindly treat the SBCO cadre as a separate cadre and should be given audit status and SBCO officials should be treated at par with DAP & P&T Audit officials and liability of 3 years tenure transfer should not be imposed on them. 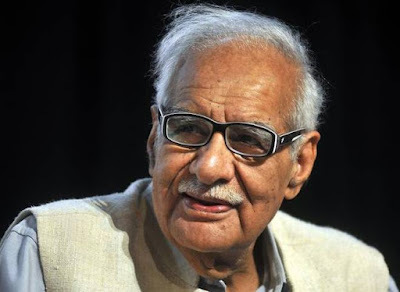 Eminent writer and journalist Kuldip Nayar passed away in New Delhi on Thursday Dt. 23.08.2018 after a brief illness. He was 95. Mr. Nayar, a Punjabi, was born in Sialkot in 1923. When Emergency was declared, he was one of the first journalists to be put in jail. We on behalf of NFPE pay our respectful homage and convey our Heartfelt condolences to his bereaved family.